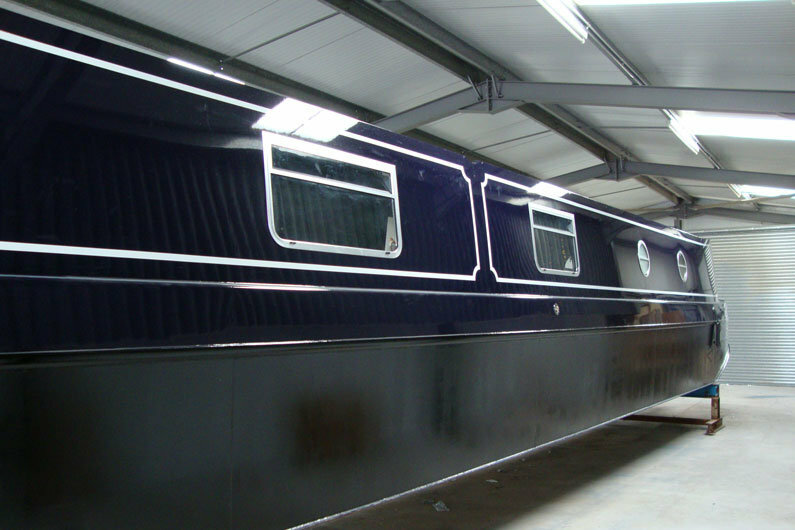 An integral part of the hull of a narrow boat is the coating system applied to prevent corrosion. 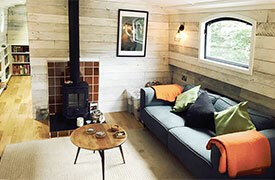 Protecting the hull of your narrowboat is vital for the longevity of your investment. 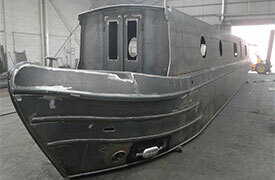 A fun subject and a fun task, hull protection is necessary if we wish to protect our investment long term. The reasons behind the need to protect the hull are simple but the corrosion mechanisms themselves are complex. Further reading on the subject can be found in our sections on Anodes and Galvanic Isolation in our Electrics chapter . Aside from galvanic corrosion, we talk a lot about the harsh day to day life of the narrow boat hull. For some of the year it sits immobile in often dirty or oily water. For the rest of the year it is bashed and battered about in locks and against mooring pilings. Hull Protection… Which Coating System? 1) Hot sprayed metal coatings have been used in the offshore marine industry for many years and now this technology is available to the inland waterways boat owner. 2) Conventional brush or roller cold applied systems that are considered integral with anode attachment to the overall protection system. If you’ve read our Anodes piece you will be aware that anode manufacturers advise on a 3 year scheme of protection. For most owners that coincides nicely with the re-coating of the hull, which also seems to need doing at around this interval. So how do you choose? Well firstly you have to find out what the hull has already been coated with. If there are potential compatibility issues and you don’t want to have the hull sandblasted, then stick with what you’ve got. There is nothing wrong with the standard bitumen based coatings so long as they are applied correctly and there is not too much heavy diesel in the water around where you moor (there shouldn’t be anyway but that’s for another discussion)! This established technology has been around for over a century. These coating solutions can be used to provide wear resistance, electrical conductivity and thermal protection but it is their proven track record in providing a corrosion resistant barrier that makes the technology particularly suitable for the marine environment. These systems are extensively used in the offshore industry to protect oil platforms, steel superstructures and both internal and external surfaces of shipping vessels. Moving ahead to the 21st Century and with the increase in pleasure boating on our inland waterways; it is an obvious technology to apply for prolonging the life of our pride and joy. It makes perfect sense when you consider that this process is simply a proven technology transfer of anti-corrosion coatings. We already accept the use of zinc anodes in the battle against galvanic corrosion, so why not coat the whole hull in a system that carries long term guarantees and offers real benefits that outweigh the cost of the process. Rather than a cold paint or roller applied system, thermal spray technology uses a low power arc occurring between two electrically charged wires to atomise the wire and turn it into a spray stream. The wire is known as the feedstock and, in the case of inland fresh water systems, is made from zinc. In effect, the process is very similar to that of arc welding where the welder briefly touches the electrode or welding rod against the work piece and then withdraws it to form a stable arc. In the case of thermal spraying, the arc is between the wire feedstock rather than the welding rod and work piece. As a result of the non-contact arc this type of sprayed metal coating is very thermally efficient and little heat is transferred to the part being coated. This is of particular importance for coatings below the waterline where it is impossible to remove insulation and panelling from a fitted boat. So, if you have ordered a new narrowboat shell to DIY fit, you build shells commercially and want to add value for your customers, or you have an existing canal boat that you want to give the ultimate hull protection to, this process is available to all owners and shell builders alike. 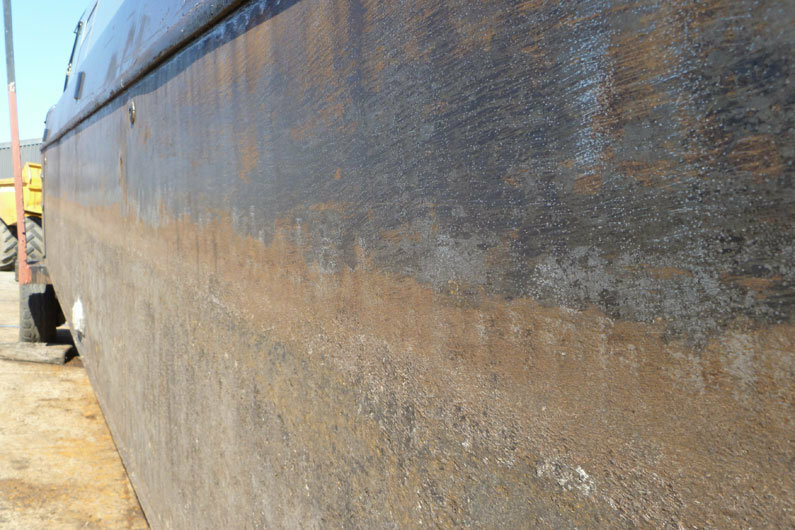 In the case of a canal boat hull, the preparation consists of grit blasting with the correct grade of blast media following the usual pressure washing process. Blasting is essential in order to provide a clean and keyed surface for the next stage of the process. Extreme care needs to be taken here that, if already applied, the upper painted surfaces of the boat are not damaged. To this end, sophisticated extraction and protection systems have been developed to ensure that only areas to be treated are prepared. The next stage consists of the metal spraying itself. Specialist application equipment has been developed specifically for our market and includes full protection for the operator. For boats used solely on the inland waterways, the metal used is zinc. For craft used in brackish waters, alloys of zinc and aluminium are used, but our advice is to fully consult with your chosen specialist application company to work out what is best for your circumstances. As we mentioned above, the metal is introduced into the application equipment in the form of wires which are electrically charged. The equipment uses a low power arc to atomise the metal, allowing it to be spray transferred onto the prepared steel hull. Experienced operators will ensure an evenly distributed coat weight which is measured to ensure consistency of coating of around 1kg of zinc per sqm. An added benefit of a spray coating is that smaller pits and scrapes will be filled, resulting in a more aesthetically pleasing end result. Following the testing of the zinc coating to ensure adequate application, the hull is then blacked in the owners’ choice of final protection system. A popular choice for a final cold applied finish is the 2 pack epoxy system which offers added water and chemical resistance over the more traditional bitumen and tar based systems. The big advantage is clear and is the fact that if raw steel is exposed via a lock or mooring “incident”, the zinc coating will provide galvanic protection and prevent the pitting we all too often encounter around and below the waterline. With the cost of even a basic sail away shell being what it is, this process adds life and value to your investment. Typically the process carries a 10 year anti-corrosion guarantee, which indicates much longer protection if you look after the hull. 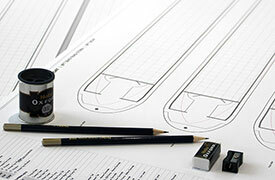 Traditional, standard blacking products widely available from most marine chandlers and on-line. Not so resistant to oil and grease but easy to apply, quick drying and with an attractive even finish. These coatings are cost effective and with care and maintenance will last until the next blacking session. “Bodied” formulations lay on thicker than standard bitumens and but less cost effective per brush stroke. Can be applied over well weathered tar based products. Better resistance to oil and diesel. Fast drying and glossy. Easy to apply due to low viscosity. 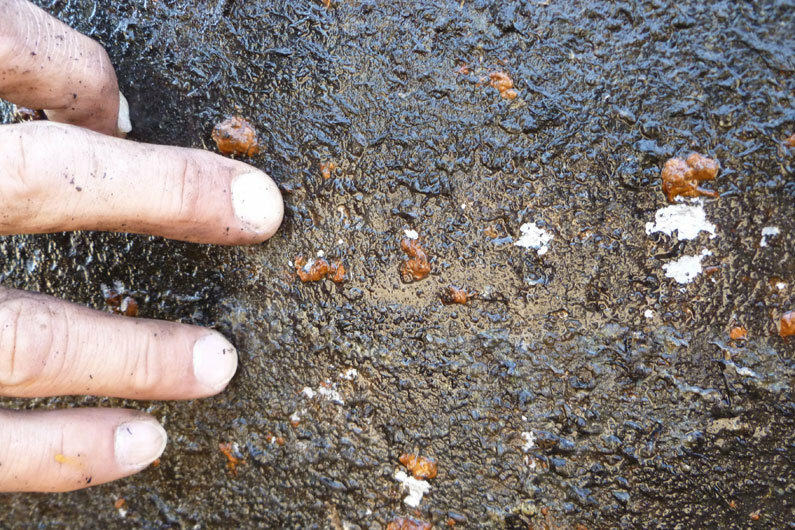 Cannot be applied over bitumen based coatings. Can give a higher gloss than bitumen based coatings and can be a lot harder to apply. They are not affected by oils or diesel. Can be applied over any coal tar based product. Cannot be applied over bitumen based coatings. A 2 part system which when fully cured is water impermeable and fully chemical resistant. Said to be abrasion and impact resistant in use. Cannot be applied over bitumen, coal tar or vinyl tar based products. Compatibility of coatings can be checked with a rag soaked in white spirit. Applied to a clean area of the hull, if the rag is only lightly stained it is tar based whereas if it lifts the coating off completely or is heavily stained it is bitumen.